Acupressure is a form of ancient, alternative therapy of applying pressure with the fingers on certain points along the energy channel in the body, based on the belief that the human body has a life energy that runs in the body. When this energy flow is disrupted, headaches and anxiety may ensue and last for a long time. Acupressure helps alleviate stress and headaches by amending the energy flow in the body. Acupressure helps stabilize the body’s energy, and it is believed to improve blood circulation, unblock nerve impulse, and providing quick relieve from stress and pressure. You may take acupressure lessons for as long as you like because it has no side-effects. It is always best to have a professional do it for you, but that doesn’t mean you cannot practice it at home on your own. Those who practice acupressure frequently would tell you that it should be done often in order to result in a strong self-healing and self-regulating system. And the best part is that acupressure is completely painless. Although, as we mentioned, acupressure is best done by an expert who knows all the acupressure points, stress and headaches tend to strike when we are alone, which is why you ought to learn all the points and the amount of pressure to apply. If you manage to find the right acupressure point and apply the required amount of pressure, you will feel a relief from stress and headache in no more than 30 seconds. Squeeze the soft, fleshy place between your thumb and forefinger (known in Chinese medicine as the Hoku spot) with your other hand’s thumb and forefinger. 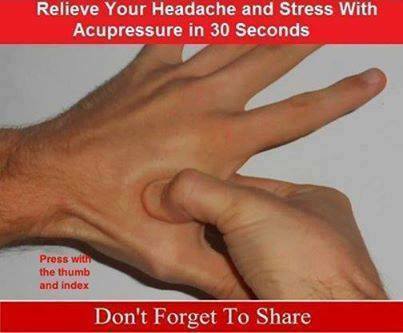 Apply the pressure there for about half a minute and it should ease stress and anxiety and relieve a headache. Keep pressing the point till the pain wears off and the muscles relax. You should feel much better in no time.